Overall We had a great cruise on the December 11, 2017 Antarctica departure of SilverSea Expedition&apos;s Cloud. Most every aspect of the cruise exceeded our expectations and our expectations were pretty high! Temperatures hovered around freezing while in Antarctica, though we had some sunny days and went about at times without our large coats / gloves. The ship can travel quite fast, and we crossed the Drake Passage in 36 hours, giving us an extra day in Antarctica! Seas were mild to moderate. Many people wore "the patch" to help with motion sickness, and the ship&apos;s reception desk handed out pills for those who needed help. 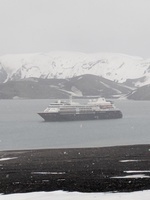 We hoped to see wildlife on this cruise and we saw plenty of birds (including penguins), several seals, and one glorious night a few people up late (10pm to midnight) saw 100-200 whales on a bit of a feeding frenzy. Bird sightings began on the crossing, and bird experts were on hand to fill you in on what you were seeing. The scenery was spectacular -- both from the ship and on the shore -- and we always enjoyed our time ashore. You see a lot of penguins, and while some passengers seemed bored by the second landing with yet more penguins, I always found them fascinating and entertaining. For those sensitive to smell, I saw several fellow passengers reacting to the penguin guano as we approached our first landfall. Our landing at the Chilean Antarctic Research Base Gonzalez Videla has us tromping through so much penguin guano that all passengers&apos; boots were power washed as we exited the zodiac and before we could step foot in the ship. We love to kayak, and were fortunate to be selected for an afternoon of kayaking; what a great experience led by a passionate and fun team. Our final stop was at Telefon Bay -- the interior of a volcanic caldera. We hiked to the edge of the latest volcanic cone and were surprised to find a small waterfall! For those souls brave enough, this was the stop for the polar plunge. A storm was blowing through the Drake Passage, with forecast of 12+ meter (36+ foot) seas; the ship&apos;s Captain held the ship overnight in a protected bay, allowing the worst of the storm to pass and giving us a milder ride back to South America. All the chairs in the dining rooms are cabled to the floor for a reason;-) I&apos;ve included below a day-by-day review of where we visited; this changes with every cruise based on weather conditions and agreements with other cruise ships; it may give future cruisers an idea of where they may visit. 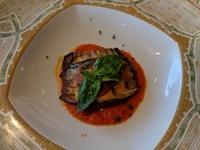 On the ship, food was generally good, service was excellent, and our cabin met expectations. The ship has just undergone significant work, and some renovations were still underway (particularly to the "Tor&apos;s Observation Lounge"). Our cabin steward and our butler were spectacular. We did organize a small party in our cabin on the last night in Antarctica and the butler sorted everything with a smile. Would we sail on SilverSeas again? Absolutely. Would we re-visit Antarctica? 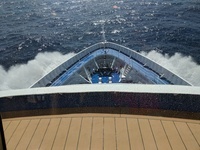 We would no re-do this cruise again; we think we&apos;d be disappointed in a return journey as our experience was that good. We would consider Antarctica again if it was a different and compelling promised experience. 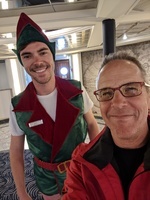 Now for some specifics...we had several questions ahead of the cruise that included clothing and charter logistics; hopefully this review will help others who are considering or are booked to sail the Cloud to Antarctica. Details We Wish We Would Have Known 1) Clothes to Pack 2) Meeting Up With The Charter 3) Embarkation and Debarkation Days 4) Daily Excursions -- Rotating Passengers to Shore 5) Kayaking 6) How Bad are Drake Passage Seas 7) What&apos;s the Video/Image Release For 1) Clothes to Pack. We struggled with how much clothes to bring -- both for the adventures ashore and for life on board the ship. Would the ship be kept so warm we wish we had short sleeve shirts and shorts? What do people really wear to dinner (and, are jeans allowed in the dining room)? What are the clothing layers required and how many of each type of layer did we need to bring? Should we purchase with the travel partner for delivery on board or bring the clothing with us? Should we rent or buy? The ship was kept on the cooler side, so we were fine to walk around in long sleeve shirts and long pants by day/night. If we went on deck, we needed at least a jacket and at times we needed our parkas. Jeans were advertised as not allowed in the dining rooms, and I even called the SilverSea office to confirm this policy before we left for the cruise. I did see a few people wearing jeans. For 2 nights on this 10 night itinerary the attire was "Casually Elegant" -- with men requested to wear jackets (no tie required); the remaining nights were casual. For the excursions, we always wore a base layer and a mid layer; these were covered by our outer layer of waterproof ski pants and the SilverSea parka. The mid layer was a fleece pullover for the top and a pair of windproof cycling fleece thermals; the cycling thermals were warm and did the job though maybe could have been more breathable -- they seemed to collect our sweat. We wore a thick pair of socks inside our rented boots. One of us had lambswool insoles for the boots. We also wore waterproof gloves, a neck gaiter, and a hat (that covered our ears). We brought along hand and foot warmers though abandoned those after about a day because we were otherwise plenty warm. We had two sets of base layer and we washed those mid-way through the cruise. We rented the boots and brought everything else with us. Those who rented waterproof pants seemed happy, as did those who purchased items and had them just delivered to the ship. The Expedition Staff did request to inspect all garments passengers planned to wear ashore to ensure that no foreign objects were transported to Antarctica; any new garments were exempt. 2) Meeting Up With The Charter. We booked our cruise as soon as the itinerary was advertised; charter flights were not even offered. 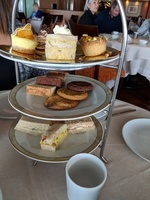 About 6 months before the cruise date, our agent informed us that SilverSea was offering us transport on the charter between Santiago and Ushuaia; we accepted the gracious offer. Logistics were sketchy -- we had a letter that said we were on the charter and we had a flight number. That&apos;s about it. No confirmation number, and no record locator code. We were told there would be someone at the airport with a sign or other SilverSea identification. For those people who also stayed at the arranged Santiago hotel, the promise was to drop off your luggage at the hotel and not see it again until Ushuaia. Here&apos;s how it worked...there were several check-in desks for the charter. You could spot those only by looking for LATAM check-in counters that showed the charter flight number. These were not so easy to spot. There were a few cruise agents trying to help; they had a small nametag to identify them and were also difficult to spot. Check-in was a minimum of 2 hours before the flight, and the airport was quite busy at 5am. We stayed at the only hotel on the airport grounds, the Holiday Inn, so that we minimized travel time. We&apos;d been to Santiago before so didn&apos;t expect to sight see. While we could get up at 4:30am and be at the airport for 5:00am, those who stayed at the Sheraton (the SilverSea arranged hotel) had a very early wake-up and I believe they had to be in the lobby at 3:30am. Apparently it was very disorganized, some guests were charged for their rooms (though they had already paid via SilverSea), and promised food / drink was difficult to find. Once we found the check-in counters at the airport all charter passengers had to check in their luggage at the counter. Even those who stayed at the SilverSea hotel had to manage their bags between the bus and the airport check-in counter. People with the same last name were generally assigned adjacent airplane seats; otherwise, you just got assigned a seat. There were empty rows on the flight, so parties could request re-seating. The flight was all Economy Class, and we were served a sandwich and a beverage on the three hour flight. On arrival in Ushuaia, we had to first clear immigration (took over one hour for those of us at the back of the flight), collect our bags, and clear customs. As you exit the jet-way and await immigration, those folks waiting on the left are passengers who have just finished their cruise -- they&apos;re taking the charter back to Santiago. After Customs, SilverSea took the luggage and transported it to the ship. Passengers were put onto buses, taken on a short tour of the city, and brought to a nice hotel on the hillside above the city for lunch. The buses each had a different assigned departure time from the hotel in order to pace passenger boarding. If believe our bus finally made it to the ship at about 4:15pm; we were one of the last buses. 3) Embarkation and Debarkation Days. We received our room keys while at the Ushuaia hotel having lunch. We only had to take a quick photo and have our credit cards swiped once we arrived at the ship. Our parka and any items we ordered / rented were waiting for us on our bed in our cabin. I presume that guests who did not arrive on the charter were able to get onto the ship much earlier than those of us who had a tour / lunch before arriving at the ship. On debarkation day, we had to be off the ship at 8:30am; luggage was collected the night before and we didn&apos;t see your luggage again until we landed in Santiago. It was a bit odd travelling with checked luggage and no luggage tag. The airport check-in counter didn&apos;t open until 9am. It was a very slow and painful drive to the airport from the ship. The airport is nice but small. A kiosk opened at about 11:00am in the international passenger waiting area for anyone who needed something to eat or drink before they departed. The flight departed a few minutes later than planned and arrived into Santiago on time. While on the flight, fill out the Customs Declaration! The flight crew gave incorrect instructions to transiting passengers. EVERYONE on the charter flight had to collect their luggage in Santiago and go through immigration and customs; if they were then departing for another country, they had to re-check their luggage in the airport lobby, get their boarding passes, and then go back through immigration to exit Chile. Many folks failed to fill out this paperwork on the flight and they were not allowed to go through customs until they had completed the form. 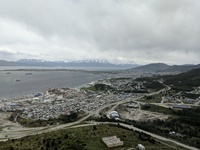 We did see a couple arrive in Ushuaia on the charter flight to start their cruise and they were rejected by Immigration; they joined us on the flight back to Santiago and missed their cruise. We presume they didn&apos;t have the correct visa for Argentina. What a shame for them, and even more so that they were allowed to fly to Argentina and then had to immediately return to Chile. 4) Daily Excursions / Rotating Passengers to Shore. Passengers each have a colored sticker on the back of their cabin key that designates an excursion group. Only 100 passengers are allowed ashore at one time, so the ships 200 passengers are divided into 4 groups of 50, and those groups are shuttled by schedule. A typical morning excursion would see a schedule like: 8:00am disembarkation for group Green; 8:15am disembarkation for group Brown. These groups are generally ashore for about 1:15-1:30, with the last group returned to the ship by 10:00am. At 10:00am disembarkation occurs for group Red, and 10:15am for group Black. Everyone is back by 12:00. Exit and return to the ship have several process steps: scan out (showing you&apos;ve departed); collect and put on your boots; wait in the line for a zodiac; travel to shore and get a short brief on the location/wildlife/return time; drop off your life-jacket; tour around; pick up your life-jacket; was off your boots in the surf/board a zodiac; get off at the ship, brush / wash off your boots in the wet area, sanitize the boots, return the boots to their storage area/put on your shoes; and scan back in. 5) Kayaking -- where conditions allow, 10 passengers at any one location are allowed to kayak as a managed group. 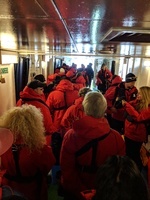 Any passengers who are interested in kayaking had to attend a scheduled briefing near the start of the cruise. Those who complete the briefing entered into a lottery for kayak spots. We were selected for kayak group 5 or so, and were able to Kayak on about the 3rd day in Antarctica. You must be able to lift yourself from a zodiac into the kayak, and then back to the zodiac when done. SilverSea provide all equipment, including a dry suit and a kayak skirt. The equipment is all fantastic stuff and was plenty warm. The kayak team is crazy good -- so passionate and fun loving. It was really magical to kayak through swimming penguins, be eye to eye with wildlife on icebergs, and (oh were we fortunate) see whales up close. 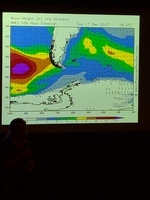 6) How Bad Are Drake Passage Seas -- they can be bad. Check out passageweather.com for an idea of wave height during your crossing. For us, it was relatively calm on the way over though many passengers were sick. Many passengers wore "the patch" and seemed to avoid sickness on the way to Antarctica. The way back was rougher. I believe we had 4-5 meter (12-15 foot) seas. The photos and videos make the sea look rather calm (no white caps). In reality, the ship would rise and fall, sometimes suddenly, with these large waves. Many folks were sick, even some who wore the patch. Reception did have plenty of motion sickness pills, and folks who took them said they helped. While I generally don&apos;t get sick, I did feel the movement on this cruise. I didn&apos;t get sick and I didn&apos;t take any medication; I&apos;m very fortunate. 7) What&apos;s the Video/Image Release Form. At the beginning of the cruise you&apos;re asked to sign a release so that any photos or video of you can be used by SilverSea. Maybe I wasn&apos;t paying full attention, but I don&apos;t think I fully understood that a video of the cruise would be made AND SOLD TO PASSENGERS who wanted to pay about $150 for a copy. I did sign over the video/image release. I was disappointed that this all inclusive cruise didn&apos;t include the video as part of the package; had I realized this at the start, I would not have released my image for use by SilverSea. Other Items of Interest. Dining quality and variety was as expected. I heard other passengers with a spectrum of views, from loving the food to very disappointed in the food. 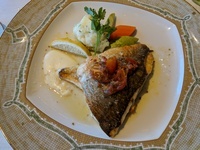 We ate one night at the Italian restaurant; I was most disappointed that my fish fillet had at least 25 bones in it. The waiter rushed over and tried to remove all of the bones. The experience didn&apos;t make me want to return. The poolside "hot rocks" dinner restaurant was surprising good. My one disappointment in the meals was dessert; nothing seemed extraordinary. The main dining room was our go-to spot for breakfast, lunch, and dinner. Tor&apos;s Observation Lounge, at the top and front of the ship, was very cold and under-utilized. Work was still underway to complete the renovation of that area. There was no service in the lounge though it would have been nice to have coffee/tea service. Maybe that&apos;s planned for the future. Wildlife Viewing. We did see much wildlife, even from the ship. I was most surprised that the ship did not announce major wildlife sightings. For example, one night (10pm-midnight) a few of us, including some expedition staff, watched as 100-200 whales were on a feeding frenzy. Everywhere we looked, we could see whale spouts with fins/tails following. It was an incredible sight. There was no announcement made. Maybe it was because of the time. Expedition Staff. They were generally fantastic. One or two seemed more interested in speaking with each other than in engaging with passengers. Some experts did a great job translating their knowledge into useful stories for us passengers (example, Fritz with his bird info); others provided technical info (glacier size) that included formulas interesting to a scientist but much less interesting to someone wanting to learn the basics. In summary, this was a fantastic cruise that exceeded expectations. SilverSea did an outstanding overall job. 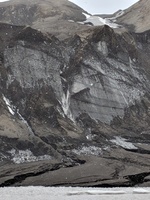 I&apos;m attaching an image of our stops in Antarctica. In text form, here&apos;s where we visited: Day 0 (extra day as we arrived early): Morning -- Aitcho Island: Chinstrap penguins, Gentoo penguins, whale bones, other birds. Afternoon -- Yankee Harbor, though this was a substitute for a planned stop that weather didn&apos;t permit us visiting. Day 1: Morning -- Brown Bluff: Adelie and Gentoo penguins. Afternoon -- cruising through Antarctic Sound and seeing fabulous large tabular icebergs. 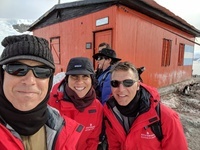 Day 2: Morning -- Mikkelson Harbor: Gentoo penguins, Argentine refuge hut, and whaling remains. Afternoon -- Cierva Cove -- zodiac cruise in search of wildlife. Day 3: Morning -- Danco Island: Gentoo Penguin colony and frequently visited by snowy sheathbills, kelp gulls, and blue-eyed shags. Afternoon: Cruising the Gerlache Straight, looking for passing wildlife. Day 4: Morning -- Nekko Harbor: breathtaking beauty surround you here. Stunning. 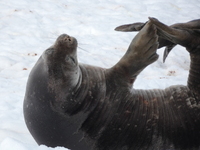 Gentoo penguins, kelp gulls, skuas, and seals. Afternoon -- Gonzalez Videla Base, Paradise Bay: Gentoo penguins nest around the Chilean research base. 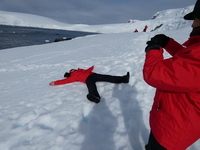 Day 5: Morning -- Halfmoon Island: short uphill climb over a cobble beach to reach a colony of chinstrap penguins. Afternoon -- Telefon Bay: hike 1 KM up to the edge of a crater for some spectacular views. Polar Plunge for those who want to swim. Places we visited on this 10 day cruise to Antarctica. Watching the water go by as we head down to Antarctica. 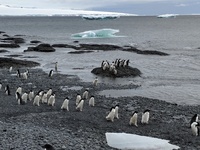 Alelie penguins on the march. Argentinean emergency hut -- for travelers who need a shelter. Trying to make a snow angel...but this was all ice, no snow. Kayaking Antarctica. It was warm enough this day for no hat and no gloves. Oh I just ate lunch...but wait, here are the tea treats. 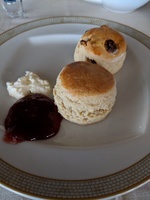 Yes, plesae, I'll have some warm scones. Cheers. 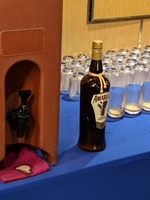 That Amarula sure is nice after dinner. 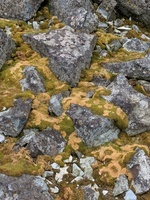 Yes, there is some plant life too. We had a great cruise on the December 11, 2017 Antarctica departure of SilverSea Expedition&apos;s Cloud. Most every aspect of the cruise exceeded our expectations and our expectations were pretty high! 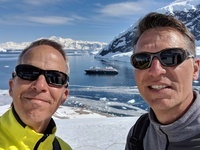 Temperatures hovered around freezing while in Antarctica, though we had some sunny days and went about at times without our large coats / gloves. The ship can travel quite fast, and we crossed the Drake Passage in 36 hours, giving us an extra day in Antarctica! Seas were mild to moderate. Many people wore "the patch" to help with motion sickness, and the ship&apos;s reception desk handed out pills for those who needed help. 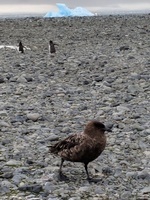 We hoped to see wildlife on this cruise and we saw plenty of birds (including penguins), several seals, and one glorious night a few people up late (10pm to midnight) saw 100-200 whales on a bit of a feeding frenzy. Bird sightings began on the crossing, and bird experts were on hand to fill you in on what you were seeing. I&apos;ve included below a day-by-day review of where we visited; this changes with every cruise based on weather conditions and agreements with other cruise ships; it may give future cruisers an idea of where they may visit. 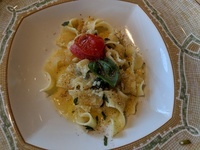 On the ship, food was generally good, service was excellent, and our cabin met expectations. The ship has just undergone significant work, and some renovations were still underway (particularly to the "Tor&apos;s Observation Lounge"). Our cabin steward and our butler were spectacular. We did organize a small party in our cabin on the last night in Antarctica and the butler sorted everything with a smile. Would we sail on SilverSeas again? Absolutely. Would we re-visit Antarctica? 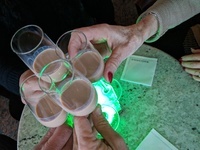 We would no re-do this cruise again; we think we&apos;d be disappointed in a return journey as our experience was that good. We would consider Antarctica again if it was a different and compelling promised experience. 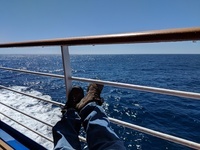 Now for some specifics...we had several questions ahead of the cruise that included clothing and charter logistics; hopefully this review will help others who are considering or are booked to sail the Cloud to Antarctica. 1) Clothes to Pack. We struggled with how much clothes to bring -- both for the adventures ashore and for life on board the ship. Would the ship be kept so warm we wish we had short sleeve shirts and shorts? What do people really wear to dinner (and, are jeans allowed in the dining room)? What are the clothing layers required and how many of each type of layer did we need to bring? Should we purchase with the travel partner for delivery on board or bring the clothing with us? Should we rent or buy? The ship was kept on the cooler side, so we were fine to walk around in long sleeve shirts and long pants by day/night. If we went on deck, we needed at least a jacket and at times we needed our parkas. Jeans were advertised as not allowed in the dining rooms, and I even called the SilverSea office to confirm this policy before we left for the cruise. I did see a few people wearing jeans. For 2 nights on this 10 night itinerary the attire was "Casually Elegant" -- with men requested to wear jackets (no tie required); the remaining nights were casual. For the excursions, we always wore a base layer and a mid layer; these were covered by our outer layer of waterproof ski pants and the SilverSea parka. The mid layer was a fleece pullover for the top and a pair of windproof cycling fleece thermals; the cycling thermals were warm and did the job though maybe could have been more breathable -- they seemed to collect our sweat. We wore a thick pair of socks inside our rented boots. One of us had lambswool insoles for the boots. We also wore waterproof gloves, a neck gaiter, and a hat (that covered our ears). We brought along hand and foot warmers though abandoned those after about a day because we were otherwise plenty warm. We had two sets of base layer and we washed those mid-way through the cruise. We rented the boots and brought everything else with us. Those who rented waterproof pants seemed happy, as did those who purchased items and had them just delivered to the ship. 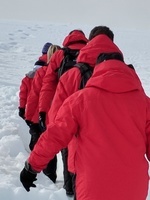 The Expedition Staff did request to inspect all garments passengers planned to wear ashore to ensure that no foreign objects were transported to Antarctica; any new garments were exempt. 2) Meeting Up With The Charter. We booked our cruise as soon as the itinerary was advertised; charter flights were not even offered. 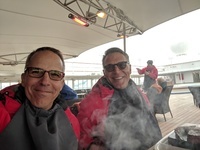 About 6 months before the cruise date, our agent informed us that SilverSea was offering us transport on the charter between Santiago and Ushuaia; we accepted the gracious offer. Logistics were sketchy -- we had a letter that said we were on the charter and we had a flight number. That&apos;s about it. No confirmation number, and no record locator code. We were told there would be someone at the airport with a sign or other SilverSea identification. For those people who also stayed at the arranged Santiago hotel, the promise was to drop off your luggage at the hotel and not see it again until Ushuaia. Here&apos;s how it worked...there were several check-in desks for the charter. You could spot those only by looking for LATAM check-in counters that showed the charter flight number. These were not so easy to spot. There were a few cruise agents trying to help; they had a small nametag to identify them and were also difficult to spot. Check-in was a minimum of 2 hours before the flight, and the airport was quite busy at 5am. We stayed at the only hotel on the airport grounds, the Holiday Inn, so that we minimized travel time. We&apos;d been to Santiago before so didn&apos;t expect to sight see. While we could get up at 4:30am and be at the airport for 5:00am, those who stayed at the Sheraton (the SilverSea arranged hotel) had a very early wake-up and I believe they had to be in the lobby at 3:30am. Apparently it was very disorganized, some guests were charged for their rooms (though they had already paid via SilverSea), and promised food / drink was difficult to find. Once we found the check-in counters at the airport all charter passengers had to check in their luggage at the counter. Even those who stayed at the SilverSea hotel had to manage their bags between the bus and the airport check-in counter. People with the same last name were generally assigned adjacent airplane seats; otherwise, you just got assigned a seat. There were empty rows on the flight, so parties could request re-seating. The flight was all Economy Class, and we were served a sandwich and a beverage on the three hour flight. On arrival in Ushuaia, we had to first clear immigration (took over one hour for those of us at the back of the flight), collect our bags, and clear customs. As you exit the jet-way and await immigration, those folks waiting on the left are passengers who have just finished their cruise -- they&apos;re taking the charter back to Santiago. After Customs, SilverSea took the luggage and transported it to the ship. Passengers were put onto buses, taken on a short tour of the city, and brought to a nice hotel on the hillside above the city for lunch. The buses each had a different assigned departure time from the hotel in order to pace passenger boarding. If believe our bus finally made it to the ship at about 4:15pm; we were one of the last buses. 3) Embarkation and Debarkation Days. We received our room keys while at the Ushuaia hotel having lunch. We only had to take a quick photo and have our credit cards swiped once we arrived at the ship. Our parka and any items we ordered / rented were waiting for us on our bed in our cabin. I presume that guests who did not arrive on the charter were able to get onto the ship much earlier than those of us who had a tour / lunch before arriving at the ship. On debarkation day, we had to be off the ship at 8:30am; luggage was collected the night before and we didn&apos;t see your luggage again until we landed in Santiago. It was a bit odd travelling with checked luggage and no luggage tag. The airport check-in counter didn&apos;t open until 9am. It was a very slow and painful drive to the airport from the ship. The airport is nice but small. A kiosk opened at about 11:00am in the international passenger waiting area for anyone who needed something to eat or drink before they departed. The flight departed a few minutes later than planned and arrived into Santiago on time. While on the flight, fill out the Customs Declaration! The flight crew gave incorrect instructions to transiting passengers. EVERYONE on the charter flight had to collect their luggage in Santiago and go through immigration and customs; if they were then departing for another country, they had to re-check their luggage in the airport lobby, get their boarding passes, and then go back through immigration to exit Chile. Many folks failed to fill out this paperwork on the flight and they were not allowed to go through customs until they had completed the form. We did see a couple arrive in Ushuaia on the charter flight to start their cruise and they were rejected by Immigration; they joined us on the flight back to Santiago and missed their cruise. We presume they didn&apos;t have the correct visa for Argentina. What a shame for them, and even more so that they were allowed to fly to Argentina and then had to immediately return to Chile. 4) Daily Excursions / Rotating Passengers to Shore. Passengers each have a colored sticker on the back of their cabin key that designates an excursion group. Only 100 passengers are allowed ashore at one time, so the ships 200 passengers are divided into 4 groups of 50, and those groups are shuttled by schedule. A typical morning excursion would see a schedule like: 8:00am disembarkation for group Green; 8:15am disembarkation for group Brown. These groups are generally ashore for about 1:15-1:30, with the last group returned to the ship by 10:00am. At 10:00am disembarkation occurs for group Red, and 10:15am for group Black. Everyone is back by 12:00. Exit and return to the ship have several process steps: scan out (showing you&apos;ve departed); collect and put on your boots; wait in the line for a zodiac; travel to shore and get a short brief on the location/wildlife/return time; drop off your life-jacket; tour around; pick up your life-jacket; was off your boots in the surf/board a zodiac; get off at the ship, brush / wash off your boots in the wet area, sanitize the boots, return the boots to their storage area/put on your shoes; and scan back in. 5) Kayaking -- where conditions allow, 10 passengers at any one location are allowed to kayak as a managed group. Any passengers who are interested in kayaking had to attend a scheduled briefing near the start of the cruise. Those who complete the briefing entered into a lottery for kayak spots. We were selected for kayak group 5 or so, and were able to Kayak on about the 3rd day in Antarctica. You must be able to lift yourself from a zodiac into the kayak, and then back to the zodiac when done. 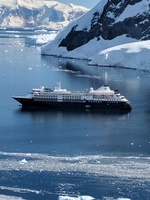 SilverSea provide all equipment, including a dry suit and a kayak skirt. The equipment is all fantastic stuff and was plenty warm. The kayak team is crazy good -- so passionate and fun loving. 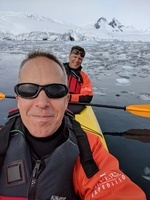 It was really magical to kayak through swimming penguins, be eye to eye with wildlife on icebergs, and (oh were we fortunate) see whales up close. 6) How Bad Are Drake Passage Seas -- they can be bad. Check out passageweather.com for an idea of wave height during your crossing. For us, it was relatively calm on the way over though many passengers were sick. Many passengers wore "the patch" and seemed to avoid sickness on the way to Antarctica. The way back was rougher. I believe we had 4-5 meter (12-15 foot) seas. The photos and videos make the sea look rather calm (no white caps). In reality, the ship would rise and fall, sometimes suddenly, with these large waves. Many folks were sick, even some who wore the patch. Reception did have plenty of motion sickness pills, and folks who took them said they helped. While I generally don&apos;t get sick, I did feel the movement on this cruise. I didn&apos;t get sick and I didn&apos;t take any medication; I&apos;m very fortunate. 7) What&apos;s the Video/Image Release Form. At the beginning of the cruise you&apos;re asked to sign a release so that any photos or video of you can be used by SilverSea. Maybe I wasn&apos;t paying full attention, but I don&apos;t think I fully understood that a video of the cruise would be made AND SOLD TO PASSENGERS who wanted to pay about $150 for a copy. I did sign over the video/image release. I was disappointed that this all inclusive cruise didn&apos;t include the video as part of the package; had I realized this at the start, I would not have released my image for use by SilverSea. Dining quality and variety was as expected. I heard other passengers with a spectrum of views, from loving the food to very disappointed in the food. We ate one night at the Italian restaurant; I was most disappointed that my fish fillet had at least 25 bones in it. The waiter rushed over and tried to remove all of the bones. The experience didn&apos;t make me want to return. The poolside "hot rocks" dinner restaurant was surprising good. My one disappointment in the meals was dessert; nothing seemed extraordinary. The main dining room was our go-to spot for breakfast, lunch, and dinner. Tor&apos;s Observation Lounge, at the top and front of the ship, was very cold and under-utilized. Work was still underway to complete the renovation of that area. There was no service in the lounge though it would have been nice to have coffee/tea service. Maybe that&apos;s planned for the future. Wildlife Viewing. We did see much wildlife, even from the ship. I was most surprised that the ship did not announce major wildlife sightings. For example, one night (10pm-midnight) a few of us, including some expedition staff, watched as 100-200 whales were on a feeding frenzy. Everywhere we looked, we could see whale spouts with fins/tails following. It was an incredible sight. There was no announcement made. Maybe it was because of the time. Expedition Staff. They were generally fantastic. One or two seemed more interested in speaking with each other than in engaging with passengers. Some experts did a great job translating their knowledge into useful stories for us passengers (example, Fritz with his bird info); others provided technical info (glacier size) that included formulas interesting to a scientist but much less interesting to someone wanting to learn the basics. In summary, this was a fantastic cruise that exceeded expectations. 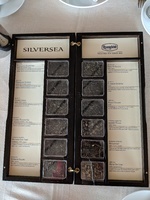 SilverSea did an outstanding overall job. 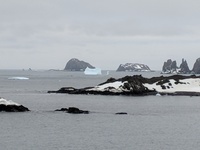 Day 0 (extra day as we arrived early): Morning -- Aitcho Island: Chinstrap penguins, Gentoo penguins, whale bones, other birds. Afternoon -- Yankee Harbor, though this was a substitute for a planned stop that weather didn&apos;t permit us visiting. Day 1: Morning -- Brown Bluff: Adelie and Gentoo penguins. 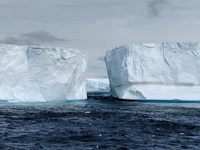 Afternoon -- cruising through Antarctic Sound and seeing fabulous large tabular icebergs. Day 2: Morning -- Mikkelson Harbor: Gentoo penguins, Argentine refuge hut, and whaling remains. Afternoon -- Cierva Cove -- zodiac cruise in search of wildlife. snowy sheathbills, kelp gulls, and blue-eyed shags. Afternoon: Cruising the Gerlache Straight, looking for passing wildlife. Day 4: Morning -- Nekko Harbor: breathtaking beauty surround you here. Stunning. Gentoo penguins, kelp gulls, skuas, and seals. Afternoon -- Gonzalez Videla Base, Paradise Bay: Gentoo penguins nest around the Chilean research base. 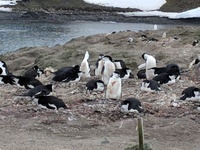 Day 5: Morning -- Halfmoon Island: short uphill climb over a cobble beach to reach a colony of chinstrap penguins. Afternoon -- Telefon Bay: hike 1 KM up to the edge of a crater for some spectacular views. Polar Plunge for those who want to swim. Cabin was recently updated and looked new. Furniture is too large for the room and chairs in the sitting area seem out of place. The TV was large and had a great picture but would rotate from bed to sitting area as we hit waves. Walls squeaked on really large waves. We were surprised how much we could hear our neighbor&apos;s TV.